For enterprises that like to adopt a smartphone with an intuitive user interface, bigger display and lightweight design to the daily operation of their customer-facing mobile workers but are concerned about the lack of ruggedness, low battery life and other disadvantages which will affect the operation efficiency, the CipherLab RS30 touch mobile computer is the right solution to meet expectations without worry. 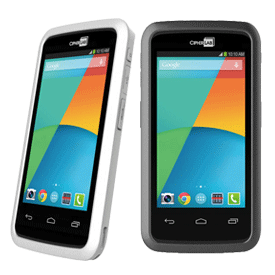 The RS30 touch mobile computer is a rugged smartphone equipped with a bar code scanner that allows mobile workers to enjoy the familiar benefits of a smartphone while reassuring the enterprise managers peace of mind through the proven industrial design to safeguard the device and collected data. 4.7" Screen, 1D Linear Imager, 802.11b/g/n, Bluetooth 4.1, WAN, GPS, 8MP Rear Camera, 1GB RAM / 8GB Flash, On Screen Keypad, 2500 mAh Battery, Android 4.4.2 KitKat GMS OS. 4.7" Screen, 1D Laser, 802.11b/g/n, Bluetooth 4.1, WAN, GPS, 8MP Rear Camera, 1GB RAM / 8GB Flash, On Screen Keypad, 2500 mAh Battery, Android 4.4.2 KitKat GMS OS. 4.7" Screen, 1D / 2D Imager, 802.11b/g/n, Bluetooth 4.1, WAN, GPS, 8MP Rear Camera, 1GB RAM / 8GB Flash, On Screen Keypad, 2500 mAh Battery, Android 4.4.2 KitKat GMS OS. 4.7" Screen, 1D Linear Imager, 802.11b/g/n, Bluetooth 4.1, WAN, GPS, 8MP Rear Camera, 1GB RAM / 8GB Flash, On Screen Keypad, 2500 mAh Battery, Android 4.4.2 KitKat Non-GMS OS. 4.7" Screen, 1D / 2D Imager, 802.11b/g/n, Bluetooth 4.1, WAN, GPS, 8MP Rear Camera, 1GB RAM / 8GB Flash, On Screen Keypad, 2500 mAh Battery, Android 4.4.2 KitKat Non-GMS OS.